By Glenda Rae DavisTamarah Begay, 32, does not know how to make coffee but everyone she had worked for believed she did. This assumption was based on one factor--that she was a woman. She was a woman that always found herself in meetings dominated by men. That was the case because she was always the only female architect. In May and after 10 years of being asked to bring coffee, Begay has opened her own firm, called Indigenous Design Studio. "I really have a big heart for architecture," said Begay, who is Naakai dine'e (Mexican clan) and born for Kinyaa'aanii (Towering House Clan). "I think architecture isn't about making money, it's about making communities better. "Comment: For more on Navajo entrepreneurs, see Navajo Runs Turkish Restaurant in San Francisco and Navajo Businesses on the Net. 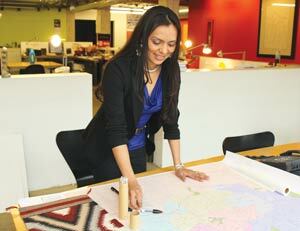 Below: "Tamarah Begay recently opened her own architect firm called Indigenous Design Studio."